VANCOUVER, British Columbia — Gabe Kalscheur made a challenged 3-pointer with 2.1 seconds left, lifting Minnesota to a 68-66 win over Washington in the final of the Vancouver Showcase on Wednesday. Washington led 66-65 and had possession, but Jaylen Nowell was called for an offensive foul with 12.8 seconds left. Minnesota didn’t appear to have a good look, but Kalscheur got enough space to get off a difficult shot that swished. It was just his second 3-pointer of the game. 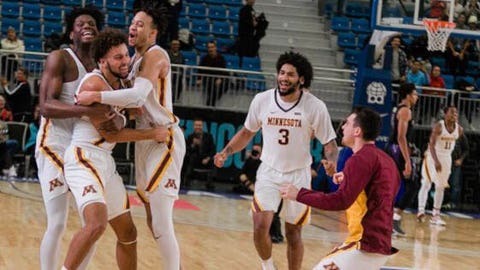 Jordan Murphy led Minnesota (5-0) with 18 points and 11 rebounds and Amir Coffey added 17 points. Kalscheur finished with nine points. Noah Dickerson matched his career high with 28 points for Washington (4-2) and Nowell added 22, but the Huskies were outscored 14-7 over the final six minutes. Playing for the third time in four days, both teams showed signs of fatigue during a lethargic first half. It was an exceptionally tough turnaround for Washington whose win over Texas A&M finished after 10:30 p.m. local time on Tuesday night and were back on the court less than 17 hours later. Kalscheur, who scored 18 of 25 points in the first half versus Santa Clara, was scoreless until hitting a corner 3-pointer with 7:37 left to pull the Gophers within 54-52. Every time Washington was on the verge of pulling away, Minnesota had a mini spurt to stay close. Washington wasn’t able to build its lead to more than five after that as the teams matched shot for shot, interspersed with some sloppy possessions. Nowell scored consecutive baskets sandwiched around a dunk from Murphy and Washington led 63-58 with 3:23 left. Kalscheur was fouled shooting a 3 and hit all three. The Gophers pulled even on Coffey’s driving layup after a Washington miss, Murphy put the Gophers up 65-63 with two minutes left. Nowell answered with a tough driving basket and David Crisp split free throws for a 66-65 lead. Minnesota had several chances on its next possession but ended up turning the ball over with 38 seconds left. Washington answered with its own turnover as Nowell was called for a charge as Coffey played excellent defense to draw the foul to set up Kalscheur’s winning shot. Minnesota: After seeing Kalscheur hit six 3-pointers in the first half a day earlier, all of the Gophers struggled from deep early against Washington. The Gophers were 1 of 6 on 3s in the first 20 minutes and 4 of 12 for the game. … Minnesota shot 26 percent and was 7 of 15 on free-throws in the first half.